Welcome to the inaugural posting of Conscience Works, featuring a collection of electronically published works on moral developmental psychology and its applications. Conscience Works grows out of twenty years of collaboration, research, writing and teaching begun by Dr. Barbara Stilwell and Dr. Matthew Galvin, both Child and Adolescent Psychiatrists, when they were members of the Indiana University Department of Psychiatry, Indianapolis. They were soon joined by Dr. Mark Kopta, a psychologist at the University of Evansville. As can be discerned from the Acknowledgements to the offering which comprises our first volume, many others have contributed time and scholarship. The Indiana University Conscience Project has grown over the years, and currently actively engages in several areas of inquiry and research which will be described below. This web site is meant to serve several purposes, including: publication of original scholarly work not available elsewhere, expansion of our special needs electronic library dedicated to conscience sensitive moral educational books for children, the teachers, parents and others who undertake their moral education, information dissemination, announcements of workshops and other meetings, other items of interest, and a chance to correspond with members of the IU Conscience Project. The original focus of the conscience study was the development and function of the conscience in normal (i.e. non- disadvantaged) children, ages 4-18. Most of these children came from stable families, were successfully engaged in activities appropriate to their ages (school, sports, church), and were judged to be free of serious psychopathology. Through the use of the Stilwell Conscience Interview (SCI), a semi-structured instrument which can be adapted for use with this large age-range of children and adolescents, with over 100 children, stages and domains of the developing conscience were discerned, analyzed and reported in several peer-reviewed scholarly articles. While this work was really in full swing, Dr. Galvin and Dr. Stilwell et al. began to devote professional attention to children who had been abused or neglected. While caring for them they wondered how maltreatment experiences affected conscience development, and thus evolved a new study. The second major thrust of what became known as The Conscience Project began. Highlights from published reports of findings as well as unpublished pilot data are contained in the review article Conscience Sensitive Diagnosis of Maltreated Children and Adolescents. A few years ago, Dr. Stilwell was contacted by Dr. Armen Goenjian who sustains a principal research interest in the effects of natural catastrophe on children and adolescents. Specifically, he proposed adapting the SCI in order to explore the effects of a devastating earthquake in Turkey in 1988. Conscience Project co-investigators were intrigued: are the effects of a single horrific event, like an earthquake, the same as the effects of long term or on-going maltreatment experiences? How differently, if at all, do child-victims of a natural catastrophe conceive of and utilize conscience from the ways that non-traumatized children do, or from young people experiencing neglect, or physical or sexual abuse? Some comparative speculations are made in the same article. The Conscience Project co-investigators continue to conduct clinical research into the effects of maltreatment on young persons of conscience but also engage in teaching conscience sensitive interview technique, conscience sensitive diagnosis of psychiatric disorders not necessarily related to maltreatment and conscience sensitive treatment of psychiatric conditions. While these are subjects lightly touched upon in the article which occupies the first volume of Conscience Works, we hope to have articles in future volumes exclusively about each. The Conscience Project promotes conscience sensitive moral education as well. 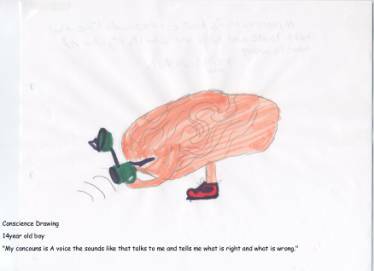 Findings from the Conscience Study have already been rendered in storybook form for middle school children. The Conscience Celebration is already freely available for downloading, complete with illustrations by Ms. Sandy Ferraro, at this same website. A study guide to The Conscience Celebration for moral educators will be available soon. In coming months we expect to offer another book entitled Rachel and the Seven Bridges of Conscience-berg, also with Ms. Ferraro's illustrations. More recently, we have begun to look at the development of professional conscience, and most specifically, the impact of medical professional training on the young people of conscience who enter medical schools. Does the conscience of a medical student or physician "look" a certain way, or exhibit particular or recognizable contouring, that is different from the conscience of another professional, for example a teacher or lawyer? Does the conscience change over the course of the rigors of professional training, for better or worse? No one doubts that medical school is challenging. Does medical training sometimes resemble or become an adverse life event, and if so, is it more like an earthquake or like abuse? For example, there are some reports that altruistic impulses may diminish as medical school grinds on; we wonder if or how this particular issue may be linked to conscience. This inquiry really is in its infancy, but we are beginning to use the SCI, this time adapted for use with health professional students/residents/practicing providers, in workshops and classes, to explore this rich area. Finally, we are deeply committed to the principles, practices and teaching of bioethics. We are finding direct, and subtle, links between our conscience work and traditional medical ethics. Conscience theory and language enrich the dialogue of ethical debate, instruction, and consultation, allowing more meaningful perspective-taking, and leading to deeper understanding and connectedness between/among the morally relevant parties. This is not meant to replace the language of principles, theory or virtue, but to augment it. Conscience Works will be one possible vehicle for making our work in this area known. Proceed to: Conscience Works I: 1-81, 2001.